- Shozan-ji means “Burning Mountain Temple”. It is Number 12 on the pilgrimage. shinde ya sanzu no, nansho aritomo. - Kobo Daishi, also known as Kukai, was the founder of the Shingon sect of Buddhism, and also the founder of the Shikoku 88 Temple Pilgrimage. 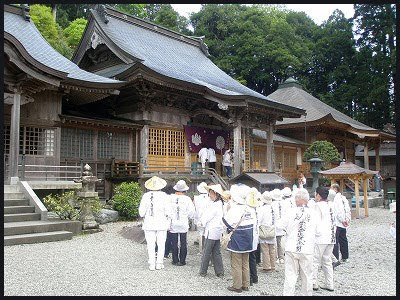 There are many legends in Shikoku about the miracles performed by Kobo Daishi. Once upon a time, a great snake (some say it was a dragon) with supernatural powers lived in Kamiyama. The great snake would cause heavy rains to fall and strong winds to blow, causing the people much suffering. Just as Kobo Daishi was visiting the area as part of his training, the great snake had just spat fire and caused the mountain before the Kobo Daishi to go up in flames, like a red ocean. Kobo Daishi felt that something was not quite right, and he began to climb the mountain while chanting prayers, and even when people tried to stop him, he just kept going. But wouldn’t you know it, as he climbed the mountain, the fire began to extinguish itself, bit by bit. The furious great snake tried to stop Kobo Daishi, but the Daishi invoked the Akasagarbha bodhisattva and conquered the great snake, and shut him up in a cave. After that, the natural disasters stopped, and the people were able to live a peaceful life. 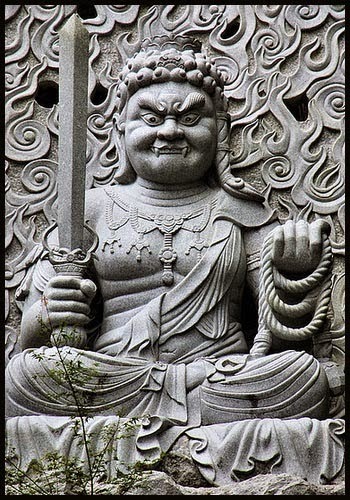 Both fangs of this Fudo are pointing down toward the earth. Legend has it that En no Gyōja (an ascetic wanderer who lived a generation prior to Kūkai, 634-701, and is claimed, incorrectly, to be the founder of Shugendō) subdued a fiery dragon here on the mountain and then founded the temple. A hundred years later, Kōbō Daishi returned to find that it was once again terrorizing the local inhabitants and was causing a great deal of damage to life and property in the area. As Kōbō Daishi ascended the mountain, the dragon's flames threatened to engulf him, but he extinguished them by forming the mudra of Turning the Wheel of the Dharma with the aid of Kokūzō Bosatsu. He was able to seal the dragon in a cave and carved two statues to guard the entrance. For this reason the temple is called Shōsanji. The mountain itself is called Marozan from the Sanskrit word for water (Vari) — subduer of flames. Among the temple's treasures is a letter from Emperor Daigo. Also, on the summit of the mountain is a small stone sanctuary enclosing a statue of En no Gyōja which memorializes his victory over that trouble causing dragon. Of interest is the tomb of Emon Saburō at a small shrine two miles down from the temple.
. 21 Temple of the Great Dragon 太龍寺 Dairyu-Ji .
. 36 Temple of the Green Dragon 青龍寺 Shoryu-Ji .
. 41 Temple of Dragon's Ray 龍光寺 Ryuko-Ji .
. 四国お遍路さん Henro Pilgrims in Shikoku .